I took half day leave today. Went to Jason's at Raffles City Mall to get some ingredients to make another Hari Raya goodie. Got back home, changed to comfy home clothes and started to make Cornflakes Crunchies. 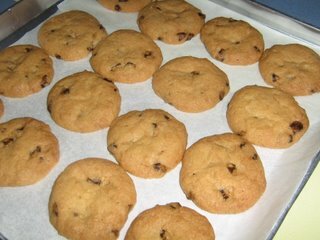 This is another recipe which I got from Resipi.net. I remembered mum used to make this cookie when I was younger. Add in egg yolk and continue beating till fluffy. Add in the sifted dry ingredients, bit by bit. 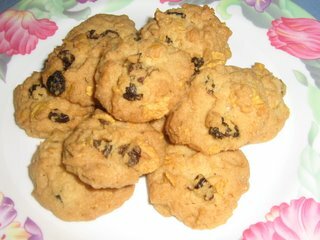 Fold in raisins and crushed cornflakes. Spoon teaspoonfuls of soft dough onto a tray. Bake in a preheated oven at 170 c for about 20 - 25 minutes. I am glad dat u tried the recipe. Yang paling best skali senang nak buat kan.
btw, siti asal dari mana? Salam sis, siti org singapore..cck. tq for sharing yr recipes..